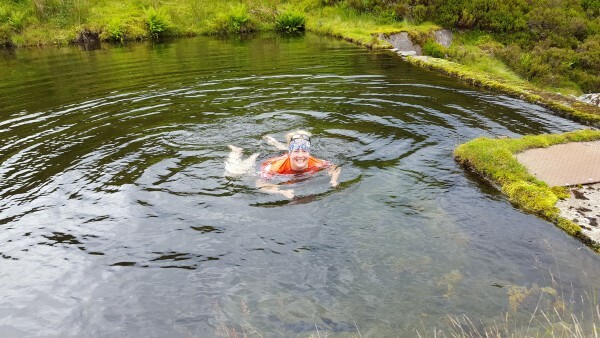 In my head I am very good at wild swimming. All of the ingredients are there: I am a strong swimmer, I love water, I am happiest outdoors and I don’t mind getting cold. However, I have to confess to having some deep-seated (and previously secret) concerns about not being able to see what is in the water with me. You never know do you, what that slimy thing you can feel with your toes is. Maybe I have an overactive imagination; that grey, cooling mud quickly becomes a dead sheep, which even more quickly becomes a human cadaver, which is then replaced by a sea-serpent… (The other night, by the way, I dreamt that I was wrestling a snake). When we found the the infinity pool above the dam, all of the signs (apart from the weather) were good. 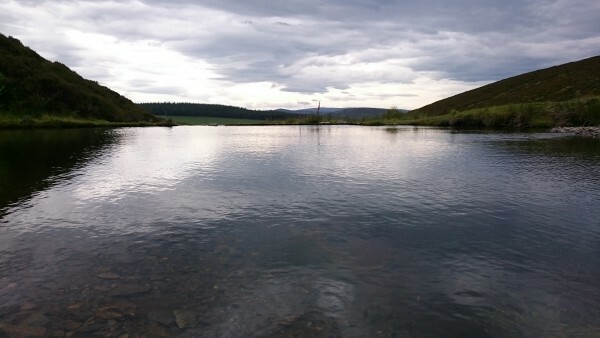 A smallish pool that could surely only fit one dead body, clear water which meant that I could see most of the bottom and almost zero midges. 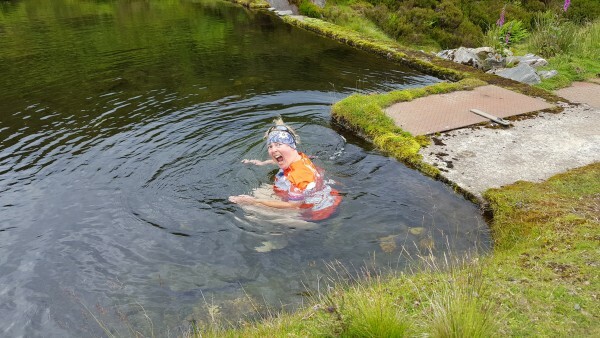 I didn’t venture in on our first visit (although skinny-dipping would gone completely unnoticed in our lonely glen) but the idea that I should have a dip stayed with me, and by day four I knew that I would have to give it a try. My Get Outside Champion credentials depended on it! 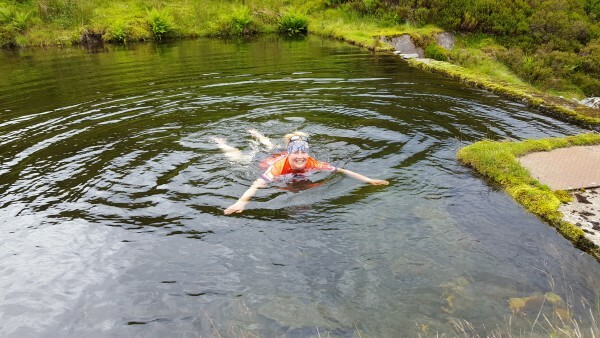 I would like to tell you that I splashed around for hours in the cooling waters; the pictures tell a very different story, but I am glad that I did it, and am determined to do a bit of Dartmoor wild swimming very soon. Strong swimmer. Hmmm. Not that way. But perhaps you were merely keeping afloat. Fact is, once you’ve got the breathing right for crawl (and it takes awhile) you’ll never want to swim any other way. I can still remember the first time I did crawl for half a mile in the municipal pool (a hazard in itself). Walking back to the car-park it was as if my blood had turned to champagne, fizzing with pride. I asked VR about it afterwards and she said “It’s the endorphins.” And the sentence immediately entered the family pantheon of touchstone sayings. Definitely front crawl in the swimming pool, but keeping your arms as close to your body as you can means that you are less likely to touch something slimy!